Once you get a new Ford F-150 home, you may decide you want to customize it. Or maybe you’ve seen one on the dealer’s lot, but you’d just like to change a few things. You’ll find a variety of practical and stylish accessories that allow you to create a truck that showcases your personality. Whether you are looking to change the styling or improve performance, you can find just what you need at Zender Ford’s Custom Truck Division! Side bars can not only give the truck a more defined style, they also make it easier for passengers to climb in the cab. Choose from various sizes, including three-inch and four-inch rounds or ovals. They can be chrome, platinum or painted to match the body colour. Improve your truck’s handling and comfort by adding customized suspension accessories. You can add a lift kit that can raise your vehicle from just slightly above factory level to over 18 cm up in the air. The best lift kits will allow you to remove them later to return the truck to stock height. You can also choose leveling and lowering kits, depending on your needs. 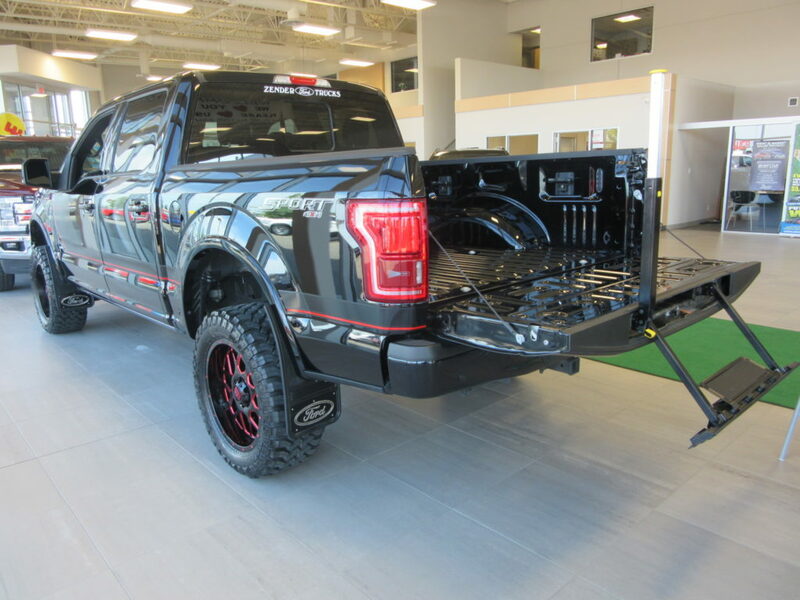 Let Zender Ford in Spruce Grove, West Edmonton, Alberta help make your truck perfect for you! Protect the bed of your F-150 with the best bed liners. They can prevent rust and other damage and keep your truck looking like new. You can find custom liners that are designed for fragile loads as well as more durable cargo.You may also want to consider upgrading with new fender flares and trim. Choose ones that bolt on or have a pocket style. They can stand out in black or silver or be painted to match the body colour. They add a rugged look to the truck and depending on what you like can either blend in or stand out. Customize your front and back bumpers to alter the look of the vehicle. The chrome stands out to make a noticeable trim, or you can have them painted to match your truck. Don’t forget the mud flaps to keep your truck clean. You can select no-drill flaps or ones that are mounted to the hitch. If you live in Edmonton, Alberta or surrounding areas, you must have flaps wide enough to cover the width of the tire on trucks and trailers, so you might as well get a high-quality option. In addition, you can choose custom tires and rims that are better equipped to handle off-road experiences. Another upgrade on your Ford F-150 is the light bar. You can choose between black or stainless steel as well as between three and four lights of various sizes. If you get the kind that require no drilling for installation, you won’t have to alter your truck for the new look.When getting your F-150 truck customized, you have numerous options. You can change the look and feel of the truck or enhance its performance with new equipment. Make sure you take your truck to the professionals at Zender Ford to have the customization done. They will make sure new equipment is in place and looks and works like it should. Why settle for a truck that looks like everyone else’s when you can have a one-of-a-kind vehicle? Zender Ford is an authorized Ford dealer in Edmonton area, Alberta. We sell and service all Ford models. If you are looking to customize your truck, look for further then Zender Ford. We have the largest selection of accessories and options to make your truck truly and uniquely yours. We can do pretty much anything you could want in terms of customizing your Ford truck, with 99% of the work being done in-house. Whether you want it lowered, lifted or stock – come down and see us at Zender Ford in Edmonton area, Spruce Grove, Alberta. We cover everywhere in Edmonton, Spruce Grove, Alberta. This truck has everything including a beautiful panoramic moon roof, leather heated & cooled seats, as well as Navigation, Sport package and so much more. This F150 has been lowered with a Crown lowering kit, 3″ in the front and 5″ in the rear to make this truck have the stance you’re looking for!! We also out fitted it with wheel-well liners a hard folding Tonneau cover and 24″ DUB Baller wheels wrapped in Ziex Falken 295/35/R24 tires.